So far, I have worn these pants only twice. I am not too worried because I got them free when I bought something else at H&M. I had great expectations for these pants when I first bought them because I thought I could put together really creative outfits, but so far I have only paired them with a white turtleneck and this black sweater and white blouse combination. I have not been daring enough to pair them with any other colors. But maybe that’s the point of wearing red pants. The other parts of the outfit can be simple to let the pants stand out. That’s the question of the day folks. 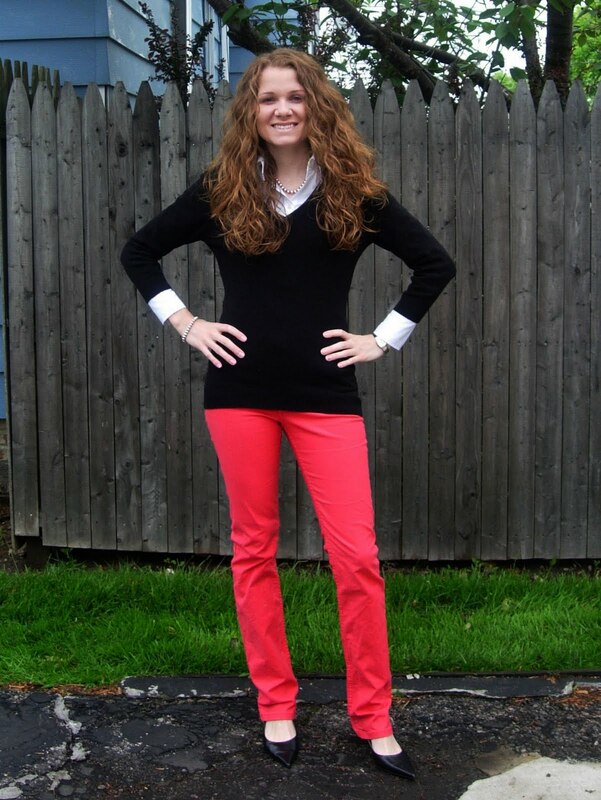 How can you wear red pants without overdoing it? And if anyone can come up with a creative name for the color of these pants, I may have to award them a prize. I really like this look! You look really put together! Soooo I love your hair. Partly because it reminds me of mine 😀 Ha. Either way those pants are rockin. Thanks for all of the comments ladies!